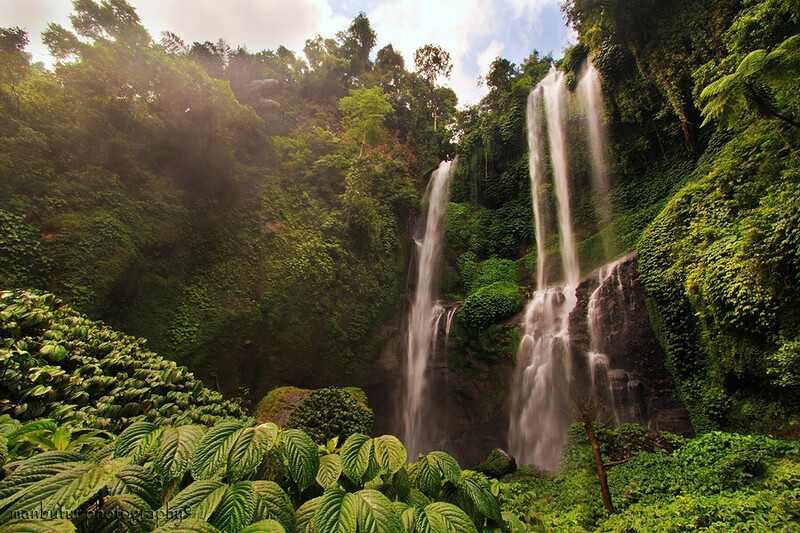 Sekumpul Waterfall is touted as the most beautiful waterfall in Bali. It is fairly close to Niagara Falls Lemukih, only about 2 km away. Understandably, the Village and Village Lemukih Sekumpul indeed neighbors. To see Sekumpul Waterfall close, it takes a bit of effort and struggle. From the parking lot, you have to walk quite far away, down a dirt road, down the hundreds of stairs, and across the river. When you ride a motorcycle, you can still ride from the parking lot (near the ticket window), to the end of the road paving. After paving the way out, the road turned into a narrow dirt road (footpath). Not long down the path, you arrived at a blank bale (gazebo) with Niagara Falls Sekumpul incredible lure. From the blank bale, seen Niagara Sekumpul very pretty in the distance. That makes this waterfall is different from most waterfalls, Niagara Sekumpul not just made up of one or two waterfalls. There are at least seven waterfalls are located separate and apart, you can see from the blank bale. Seven waterfalls scattered in the high cliffs and surrounded by green trees soothes the eye. Seventh waterfall has a shape and a different height. Absolutely amazing. Not one did, when Niagara Sekumpul crowned as the most beautiful waterfall in Bali. 6 pax / Car is Maximum Capacity.